Whether you have food allergies or are just looking for some healthier meals while traveling through Prague, check out my recommendation on how to keep it clean while in the Czech Republic. Last week I wrote about the changing face of Prague with a lot of developments happening in a short amount of time since their independence. Included in these developments has been a changing food scene. The Czech Republic might not be the first place someone thinks of for healthy dining options. And for quite a while, it hasn't been. 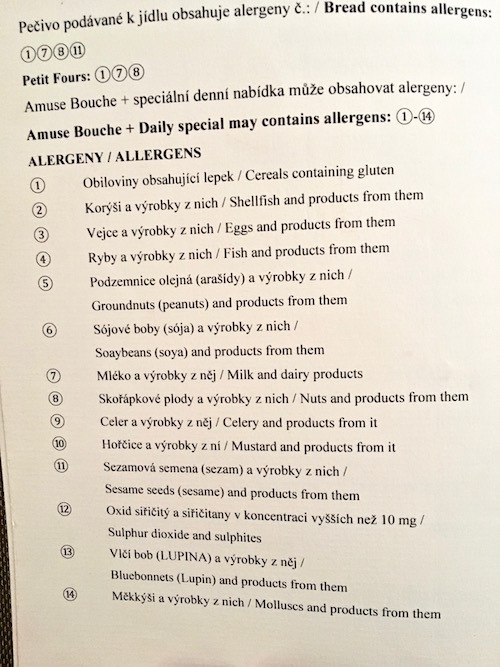 In fact, just last year, a law went into effect requiring restaurants in the Czech Republic to list food allergies on the menu. When I say list food allergies, I don't mean write that a dish is gluten free. It goes beyond that. There's a dietary restriction chart that includes 14, yes 14, items for allergy sufferers. Some of the 14 include what you might expect like gluten and shellfish, but you'll also find mustard, sesame seeds, sulfur dioxide, and celery. 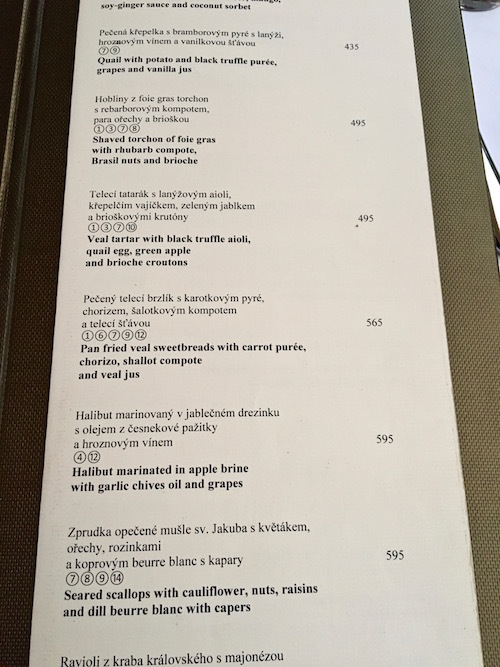 In several restaurants in Prague, the entire dietary restriction glossary was printed on the back of the menu with a number next to each item. Then you'll see those numbers listed next to the menu items that contain the allergen. I was avoiding gluten, eggs, milk and soy, so I made sure to avoid numbers 1, 3, 6 and 7. Knowing the numbered system is also helpful if the menu isn't in English. All you have to do is look for the numbers you don't eat, and hope you like the rest! 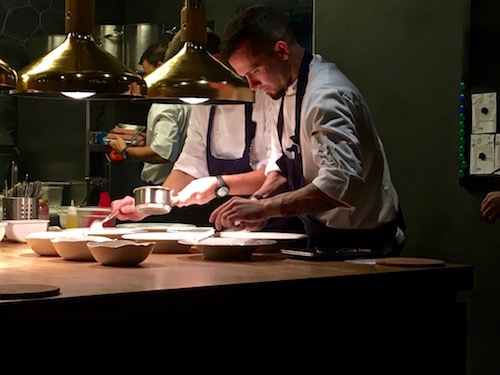 La Degustation is one of the top restaurants in Prague, so if you have a food allergy, you simply tell them what you don't eat and they take care of you, without the need for the numbers. Otherwise, your only choice is a tasting menu of either 6 courses or 11. We did the 6 course ($100) with wine pairing ($55) and were more than pleased. La Degustation Boheme has an open kitchen (you can read about my open kitchen obsession here) that I happily watched throughout the whole meal. A team of a half dozen chefs and servers produced a well choreographed dance for many hours, producing one beautiful, perfectly plated dish after the next. The serving dishes were rustic and playful while the food was delicate, but well pronounced. 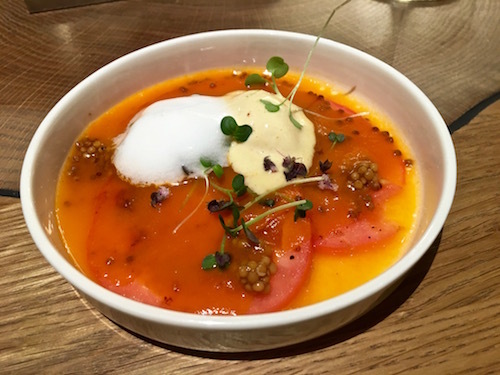 There was everything from stuffed peppers in its own infused juices, to tomatoes with mustard thyme cream. 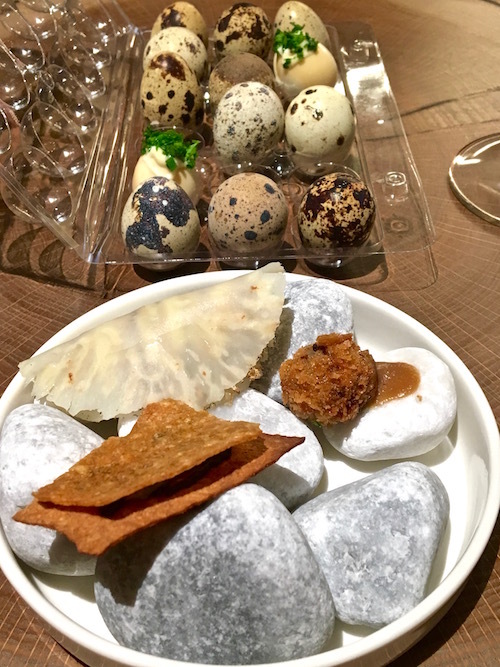 The proteins covered land and sea, along with some points in between with dishes like trout with almonds and dill, chicken with corn and truffle, and beef heart with Prague ham and horseradish. Each plate provided just the right amount of taste in a nice portion size. They even ended the evening with homemade marshmallow, separated into thick ropes that needed scissors to break them apart. Degustation Boheme Bourgeoise is truly a special meal with impeccable and warm service. If you want a light bite like we did before catching a concert at The Municipal Hall, check out Cotto Crudo in the 4 Seasons. The name means cooked and raw so you can choose hand-sliced prosciutti or salmon and scallop crudo or bigger items like pastas, meat or fish. 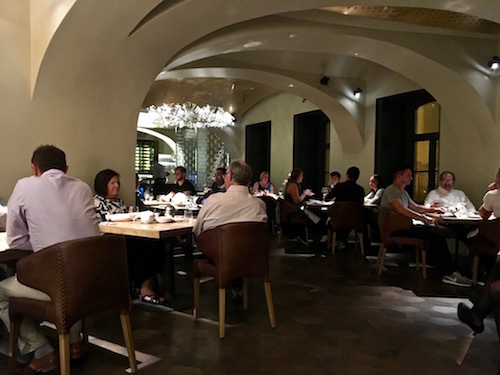 The modern dining room has a view of the water along the back wall and the flawless service you'd expect at the 4 Seasons. Kampa Park puts you right on the water in Prague. They have an outdoor patio overlooking the Charles Bridge that can't be beat. The menu has fresh fish, rack of lamb and several vegetarian dishes like artichoke risotto and a charred leek and forest mushroom medley. Make sure to reserve your waterfront seat ahead of time so you can take in the views with your meal. If you want something more casual to fit in during a day of sight seeing, look for the hidden gem, T-Anker. Once you find the elevator to the 5th floor, you'll be treated to great rooftop views of Prague on the outdoor deck. They have burgers, ribs, salmon and salads and a large beer selection to sit out and enjoy the sweeping city views. This little gem has a great patio overlooking some of the greenery in Prague. You can also get a nice big green leafy salad with some vegetables and a simple oil and vinegar dressing. It's a good spot to hit after visiting the amazing Srahov Monastery. There's still more to come from my European adventure! For additional travel inspiration, try one of these posts.